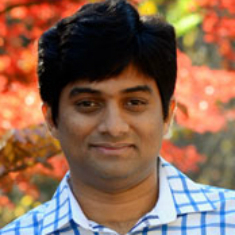 Dr. Rudraraju is a health informatics researcher with extensive experience in designing software and database architecture for health information technologies. He also focuses on applying machine learning and natural language processing to discover valuable insights from healthcare data. Dr. Rudraraju is a health informatics researcher with extensive experience in designing software and database architecture for longitudinal patient registries. His current research is focused on applying machine learning and natural language processing to discover valuable insights from healthcare data. During his graduate studies, Dr. Rudraraju worked as a lead developer on a research project funded by Google to develop a voice-activated interface to enable children with cerebral palsy to experience the joy of programming. His team presented the outcomes of this project at the Massachusetts Institute of Technology (MIT). Thereafter, he worked as a lead developer and software architect for several NIH- and industry-funded research grants. In 2013, he joined the Kirklin Institute of Research in Surgical Outcomes (KIRSO) and played a key role in completing a major re-design of the database and software behind Intermacs and Pedimacs patient registries. Over the next three years, he worked with the team at KIRSO to create a unique software framework to build patient registries. As an architect and senior developer, he made significant contributions towards developing the reusable design and implementation of the framework. The framework was a huge success and helped cut down the development time of newer registries by more than 50%. This allowed KIRSO to rollout registries (to track patients with various heart conditions) at an international scale. Currently the registry software developed by KIRSO has a global footprint in 38 countries, 319 hospitals, and 62,000 patients.